As you may have heard, the National Hockey League is on strike. That didn’t stop Flyers Charities from holding their inaugural Halloween 5K Run and Family Fun Walk on Saturday, October 27! Fox Chase Cancer Center was excited to be a part of this fun event at the new Xfinity Live! The party started at 9am with Coach Peter Laviolette, dressed as a referree, his wife Kristen, dressed as Coach Laviolette, their two daughters as Oompah Loompahs and Flyers alumni Derian Hatcher (costume-free, unfortunately!) sounded the horn for over 400 runners to take off from the 5K start line! The race itself wound around the Wells Fargo complex and finished back at Xfinity Live! (I was the 2nd place female in the race, so I’m extra proud of this one!) The weather was absolutely perfect for a 5K, and we all made it through the finish line well before Superstorm (a.k.a. Hurricane) Sandy blew in! Here I am (second-place) after the race with Fox Chase’s Andrea Tillman. For the non-runners, a costume parade, moon bounce, street hockey and more provided entertainment. 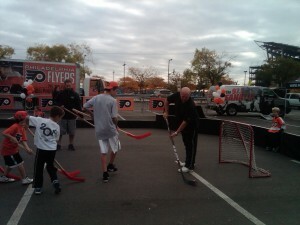 Flyers alum Bob Kelly taught the kids hockey skills before they got to meet Flyers announcer Bob Coates. Fox Chase’s Andrea Tillman was on-hand to provide information about our services, including the Mobile Mammography Van. There were plenty of other groups there as well, including Living Beyond Breast Cancer and the Leukemia & Lymphoma Society. Thanks to the Flyers Charities and Comcast-Spectacor Charities for supporting cancer awareness!